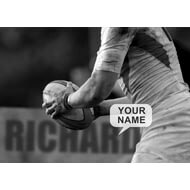 Here's a relevant gift for a rugby player or fan. 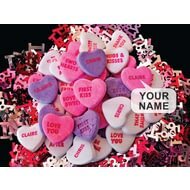 The personalised poster includes the name of the recipient integrated into the image as an advertising hoarding. A dramatic coloured poster to brighten up the room of a football fan. 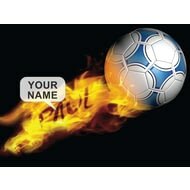 The image shows a flaming football with a name integrated into the flames. Put your love for each other in the frame with this colourful image poster. This is an amusing poster for a footballer or a football fan. 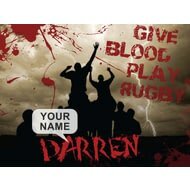 This dramatic image and message combine to make the ideal poster for a rugby player or fan. With the recipient's name 'written in blood' and integrated into the image. 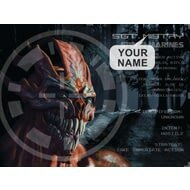 The personalised poster includes the name of the recipient integrated into the image. 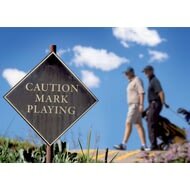 For the keen golfer in your life this poster is a humorous addition to their trophy collection. This colourful and humorous golf scene poster is the ideal gift for any golfer. 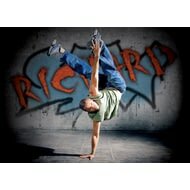 Brighten up the pad with this cool poster of a break dancing dude going through his routine. Thank your mum in a unique way with this personalised poster. The colourful print features a bouquet with a card that has her name embedded on it. This cute scene will touch the heart of any feline fan. If they're into Sci-Fi in a big way here's a novel poster for their collection. It features an alien encounter scene, along with graphics. 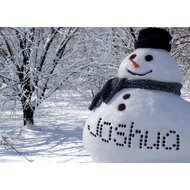 A wintery scene with a personal touch, this individualised poster would not be out of place as a Christmas decoration. 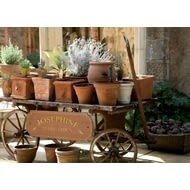 This colourful poster with its beautiful and tranquil herb garden scene makes the perfect gift for a keen gardener.